Slinging it isn’t everyone’s idea of how to wear a bag. To many at TravGear a sling-design not only feels insecure, but that cross-body strap interferes with clothes and just feels unnatural. Disagree completely? In that case, you’ll move Moshi’s latest compact backpack, which is otherwise an excellent option for urban and work travel. Although not as clearly modular at Moshi’s excellent Arcus daypack capable of carrying a DSLR camera that we reviewed recently, the Venturo serves several uses. At its core it’s all about carrying a 15-inch laptop – specifically a 15-inch MacBook Pro Retina – but it’s just as useful for carry files (even a large A4 ring binder, which few bags like this can stow successfully), magazines, or even a spare shirt etc. for an overnight trip. However, it’s most suited to carrying to work, or for going on a short work expedition or conference trip. An unashamedly rectangular bag, the Venturo is designed to keep its form even when full. It’s got enough capacity and some stretch in it just in case you need to shove a rolled-up jumper or coat in, but this bag is about compact travel and will appeal most to those who like to keep things well ordered. You can tell that from its pockets. Our favourite is along the bottom; a small zipped compartment that contains a drawstring bag – it’s perfect for stowing a raincoat well away from electronics. It also fits a small travel umbrella. The front of the Venturo adds a long pocket for a magazine or newspaper and a diagonally-accessed zipped pocket for tickets, and perhaps a passport. However, the latter is probably best left either inside or on a small zipped pocket on the reverse, just above some generous padding. That cross-body strap may not be our favourite style, but it is easily adjustable, which saves the day. 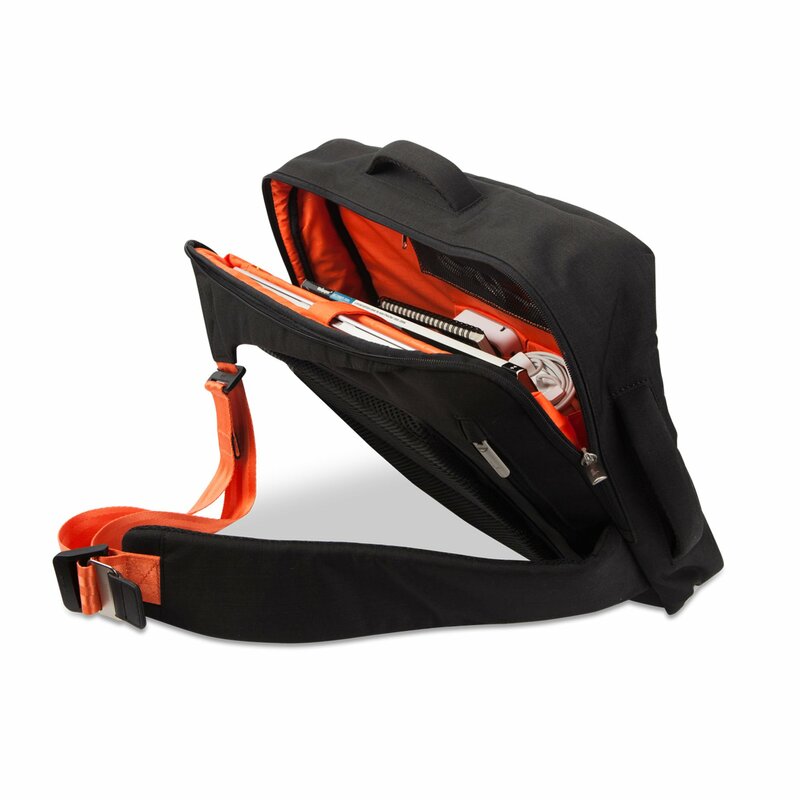 However, inside the Venturo is where the action happens; generous padded compartments for a 15-inch laptop and a 10-inch tablet can be secured using a Velcro strap, while opposite is a small netted pouch for pens above two fold-over, Velcro-secured pockets that are ideal for phones, or other small items. There are two sturdy grab handles both the top and sides of the Venturo, too, which are great for travel, and even better for faking a briefcase-look at a work function. Clearly a lot of thought has gone into designing the Venturo, with zipped compartments for everything and an overall very clean, modern design that’s all about organisation. Excellent work!